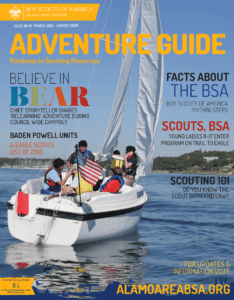 Bring your New Cub Scout out to their first Outdoor Adventure! THIS IS THE LAST OPPORTUNITY FOR THIS EVENT! Newly registered Cub Scouts and their parents can come enjoy outdoor adventure at either McGimsey Scout Park located at 10810 Wedgewood, San Antonio, Texas 78230. Early registration is only $8.00 online, once online registration closes walk ins are $10.00 at the event. November 10th: McGimsey Scout Park, 10810 Wedgewood, San Antonio, Texas 8:30 am to 12:30 pm. We are offering a special event for our New Lion Scouts where they will get to participate in activities with other Lions from around the area. This is an easy, fun afternoon for Lions to be able to come out for their first activity at a Council Level. 1. November 10th: McGimsey Scout Park, 10810 Wegewood, San Antonio, Texas. 1:00 pm to 4:00 pm. Please click the orange registration button to the right of this event article to begin your adventure, TODAY! For more information, you can also contact the Outdoor Adventure team by email at Adventure@AlamoAreaBSA.org or by calling 210-341-8611. Visit our other outdoor adventure opportunities by visiting www.AlamoAreaBSA.org/Adventure.